Translated from French by Maren Daniel. Edited by Denile Doyle. It is understood that the promotion of Venezuelan democracy and the generalized distress that is growing in the country are the least of Donald Trump’s worries, even though the authoritarian president Nicolas Maduro is in no position to teach him lessons, capable as he is of denying the very existence of the humanitarian crisis and reducing everything that is going wrong to American conspiracy. 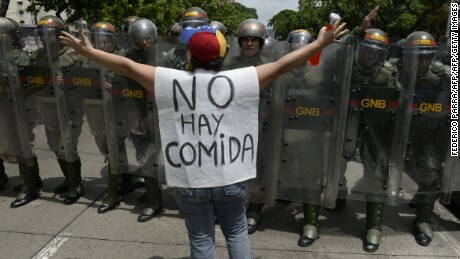 The result: A report by the Food and Agriculture Organization of the United Nations indicated on Tuesday, April 2 that Venezuela is on the verge of “acute food insecurity.” According to another U.N. report released Thursday, March 28, a quarter of the population, which is 7 million people, urgently need food assistance. The U.N. cites frightening statistics, finding that 94% of people today are living in poverty. Medicine and drinking water are lacking, hospitals are no longer operating, 3.5 million Venezuelans are in exile, wandering around neighboring countries. The expected scenario was that Maduro’s opponent, Juan Guaidó, who proclaimed himself acting president last January on the basis of widespread internal and external support — from the streets of Venezuela and from 50 or so Western and Latin American capitals lead by the U.S. — would succeed in bending the regime to his will and in toppling the army, in such a way that he takes the country out of its impasse. All that effort of imagination has gone to waste. Backed by China and Russia, who are protecting their investments, Maduro is hanging on. Guaido’s promises of amnesty did not convince the army to take the risk of losing its grip on the economy — control over oil exports and imported food — that Chavism entrusted it with. The U.S. will not give up on Venezuela now. They never tried to do anything but overthrow the late Hugo Chavez from the moment he came to power in 1999, adhering to the old and damaging Monroe Doctrine. What is more, the U.S. never even entertained the idea of co-existing with this leftist — and, moreover, Cuban-loving — regime, entertaining the idea even less because the country’s influence is based on extraordinary oil reserves. The American sanctions imposed in the summer of 2017, blocking Venezuela’s access to the international financial system, perhaps marked a turning point. Before that point, it would still have been possible for the country to get back on its feet on its own; now the regime’s corruption and errors in managing the economy have finished the job. Also, objectively, Washington has no interest in getting involved in a military intervention. Failing to achieve its goals with the “Democratic transition” incarnated by Guaidó — and that Chavez’s disciples are trying to disqualify in any way possible — the American strategy consists of continuing to kill off Maduro’s regime slowly. It is a war of attrition. Electorally, the strategy allows Trump to court the Venezuelan vote in Florida — a key state — ahead of next year’s presidential election. Meanwhile, in Venezuela, the repression applied by the regime is closing all avenues of dialogue. With the crisis becoming international, the space available to Venezuela for the exercise of its national sovereignty is shrinking. The affair is taking on the feel of a Cuban style East-West clash, and it is as if history never taught us anything. These last few weeks have, in any case, torn the humanitarian argument apart. The democratic and humanist considerations that have justified the anchoring of countries like Canada to American interests have not helped.